Sorry, Frankie, but the only relationship with Jesus that can save your soul is an intimate, personal and direct relationship with The One who bore your sins on the cross at Calvary. And you do not need the Roman Whore to do that. In fact, it is the Catholic Church that keeps people from becoming saved. THE VIDEO IN THIS ARTICLE SHOWS PROOF-POSITIVE, ONCE AND FOR ALL, THAT POPE FRANCIS AND THE VATICAN WHORE ARE THE ABSOLUTE, SWORN ENEMIES OF GOD THE FATHER, GOD THE SON AND GOD THE HOLY SPIRIT. MAKE THIS VIDEO GO VIRAL AND EXPOSE FOR ALL TIME THE VATICAN AGENDA TO SEND YOUR SOUL TO HELL. 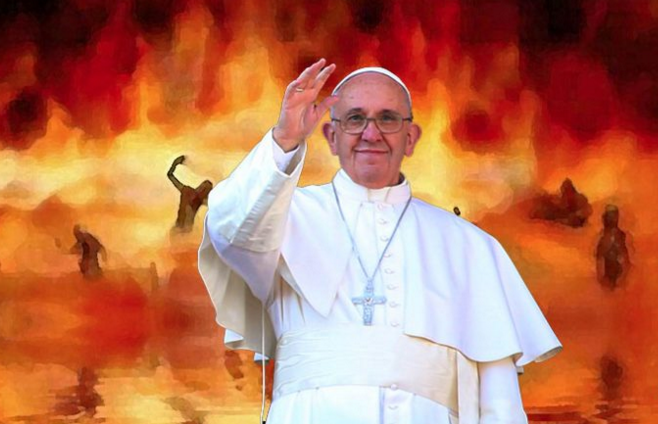 Revelation 17 and 18 shows us clearly how God views the Roman Catholic Vatican system, what their true agenda is, and what their soon coming end will be. The video in this article shows proof-positive, once and for all, that Pope Francis and the Vatican Whore are the absolute, sworn enemies of God the Father, God the Son and God the Holy Spirit. Make this video go viral and expose for all time the Vatican agenda to send your soul to Hell.